No other feature defines the face like the nose. An ideally shaped nose can highlight your natural features, but cosmetic imperfections can distract from an otherwise beautiful appearance. Dr. Kotler is a Beverly Hills rhinoplasty superspecialist; he is renowned for his surgical precision and natural-looking results. He can expertly refine a nose using only internal incisions, allowing you to achieve your best look without any visible scarring. Ethnic rhinoplasty refines certain traits while highlighting your unique ethnic features. It’s common for this procedure to involve advanced techniques, such as cartilage grafting to build up the nasal bridge, which is why it requires the utmost skill and experience. As Beverly Hills’ leading rhinoplasty superspecialist, Dr. Kotler is the trusted choice for those seeking ethnic rhinoplasty. For those who want to avoid surgery, permanent non-surgical rhinoplasty is an excellent alternative. Dr. Kotler is proud to offer Silikon 1000, which is a soft-tissue filler that provides long-lasting results. This permanent filler consists of liquid medical grade silicone, making it the perfect choice to disguise minor cosmetic flaws of the nose and to create a refined profile without surgery. If you’re unsatisfied with the results of a previous, initial cosmetic nose surgery, revision rhinoplasty in Beverly Hills with Dr. Kotler can provide the results you were hoping for. Dr. Kotler’s goal is to create natural-looking noses and to set realistic expectations, so patients know exactly what to expect. Overcorrection in an initial surgery can create unappealing cosmetic changes and, in other cases, a primary procedure may not have sufficiently fixed a patient’s expressed concern. A second rhinoplasty with our superspecialist can help you feel confident in your appearance. Sun exposure, lifestyle factors, and gravity all eventually take a toll on facial appearance. Some of the major signs of age – like sagging skin, deep creases, and jowls – can make you look older than your years. Facelift surgery reverses these age-related changes and restores a naturally youthful appearance. As a highly experienced, board-certified facial cosmetic surgeon, Dr. Kotler has a proven track record of achieving superior facelift results. The chin and the nose both play important roles in creating a balanced profile. A weak or recessed chin can cause the nose to look large and vice versa. With subtle silicone implants, Dr. Kotler can augment the chin and improve the jawline. Whether you are seeking a strong, masculine aesthetic or an elegant jawline, Dr. Kotler can customize the procedure to your needs and cosmetic goals. Treatment of aging on the neck can dramatically improve your appearance. Over time, the neck develops sagging skin, deep wrinkles, and vertical banding. With neck sculpture, and through a small incision hidden under the chin, Dr. Kotler can restore a slim, youthful neck silhouette and eliminate the appearance of a double chin. This is a standalone procedure for patients who aren’t ready for a facelift but need their neck touched up. What if there were a way to address deep wrinkles and sagging skin without the inconvenience of surgery? With Dr. Kotler’s deep wrinkle removal, patients have a non-surgical option for treating the major signs of age. The Kotler Technique of facial skin rejuvenation can dramatically erase deep wrinkles, age spots, crow’s feet, and more. Our before-and-after photos show the transformative power of cosmetic facial procedures. From facelift surgery to deep wrinkle removal, our procedures help patients look and feel their best. Browse through our patient before-and-after photos to visualize the results you can achieve with Dr. Kotler’s expert approach. Dr. Kotler performed a rhinoplasty on me 20 years ago. As I have aged I noticed my nose had changed but it didn’t really bother me enough to have an additional surgery to correct it. I reached out to Dr. Kotler about a different issue and we set up a time to FaceTime, during that appointment I mentioned that I felt like my nose had changed as I have aged and Dr. Kotler suggested I have silicone injections done to modify the changes I had seen to my nose. Since this was not surgery but a quick in office procedure I decided to have it done. I am so glad I did! I did not feel a second of pain and my nose looks so much better! You never realize what a difference something makes until you have it done. Thank you Dr. Kotler for giving me back the nose I wanted without down time or discomfort! I am a 60 years old registered nurse, and have wanted to get a face lift for many years. I was lucky enough to have had a friend recommend Dr. Robert Kotler. From the day I walked in, I felt I was taken care of from speaking to Mary, Dr. Kotlers nurse to the front office staff to Dr. Kotler himself. I felt that he was going to do everything he could to make me look as beautiful as he could. I truly feel beautiful. My friends that don’t know I had anything done keep telling me that I look amazing, and that they love my hair. This is so important to me, because I look natural, like I just came back from the best vacation EVER. Thank you to Dr. Kotler and everyone in his office. Dr. Kotler is the BEST in the business!!! This month, I was accidentally hit directly on the nose and went to see the doctor to make sure everything was okay. He previously fixed my nose over a decade ago. Since he did such a good job, some of my other family members have went to him over the years and loved their results too. It was really easy to make the appointment, he thoroughly explained everything, and put me at ease. Was great to see the Doctor after all these years. Thank you, Dr. Kotler! When it comes to enhancing your appearance, put your trust in the hands of a true superspecialist. 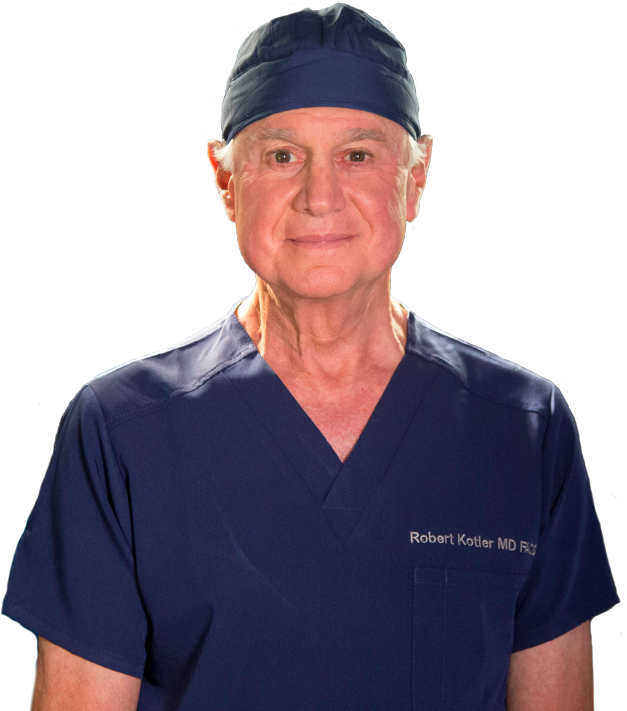 Board-certified facial cosmetic surgeon Dr. Robert Kotler has consistently delivered superior results for over 30 years. His exclusive techniques – including the Kotler Nasal Airway – are aimed at providing the highest standard of care for patients. From the initial consultation to follow-up appointments, patients receive personalized care every step of the way. Dr. Kotler has been featured on many hit television shows.